How embarrassing; a 43 point advantage whittled to a 19 point deficit in the space of two months must make Nico Rosberg a no-hoper for the 2016 title, right? Maybe. But the F1 World Championship has seen plenty of post-August comebacks, both large and small, at least one of whom’s lessons should be easily accessible, providing he calls his father as often as we know all well brought up sons should. Compared to today’s mammoth calendar, every gap between F1 races was a holiday in the 1960s, with only 10 events making up the Formula 1 season. Nonetheless, Surtees successfully clawed back a 20 point halfway stage deficit to win it at the final round in Mexico. The mother and father and all related and unrelated offspring of the post-August comeback; a story so amazing they made a film and put Ron Howard in charge of it. Okay, so everyone knows the main reason was Lauda’s fiery Nurburgring crash but it’s often forgotten Hunt was already an eye-watering 35 points – or just under 100 in modern currency – behind going into that race. 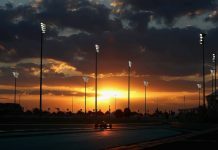 He famously clinched it at a sodden Fuji in near darkness; probably Nico’s only remotely relevant omen given the season finale sunset race in Abu Dhabi. All is not lost, Rosberg-son-of-Rosberg. 34 years ago your old man left July behind not only 16 points off the sadly soon to be discounted Didier Pironi (after a career-ending crash at the German Grand Prix) and a good 7 back from John Watson, but 5th in the overall table, trailing the likes of Alain Prost and Niki Lauda as well. 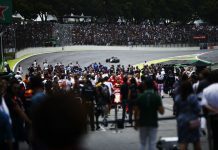 But a sequence of five consecutive finishes – including his first and only season victory at the Swiss Grand Prix (actually held in Dijon – don’t ask) – secured, thus far, the one and only Rosberg family title. Not that there was an August break back then, but Alain began the month 7 points behind Mansell’s superior Williams Honda off the back of a trip to Germany, where he’d publicly advertised the inferiority of his equipment by having to push his thirstier, less powerful TAG-powered Mclaren over the line after it ran out of fuel. A topsy-turvy run-in nevertheless gave him a sniff of victory heading to the season finale and the rest is history; Nigel Mansell’s puncture and the Williams team safety call for teammate Nelson Piquet handed Prost the improbable, once again running out of fuel only this time after he’d crossed the line in 1st place. Entering the final furlong 7 points behind Lewis Hamilton and a further 3 from teammate Mark Webber, Vettel nonetheless still had enough in hand to endure his very own Marx Brothers-esque Belgian Grand Prix, blow his engine to smithereens in Korea and get out-pointed by Fernando Alonso during the same period to clinch his first world title. “James Hunt was only ahead at the last race as well,” he pointed out, having only been in pole position for the World Championship on the 55th and last lap of the Abu Dhabi finale. Something Alonso, for one, probably didn’t need reminding of. Ironically, what is probably now Rosberg’s only glimmering hope; the German skipped off into the 2014 August break with a handy 11 point cushion, which he immediately extended to 29 after the infamous Spa tete-a-tete. Publicly rapped on the knuckles by his team, Nico was subsequently taken to the cleaners, put on the fastest spin cycle, bagged up and sold to the local charity shop as Lewis triumphed in 6 of the next 7 races, ending up an admittedly double-points finale extending 66 points behind his teammate.